"WebRTC Protect" controls how your browser uses WebRTC. Since WebRTC implements STUN (Session Traversal Utilities for Nat), it can reveal your private and public IP addresses. 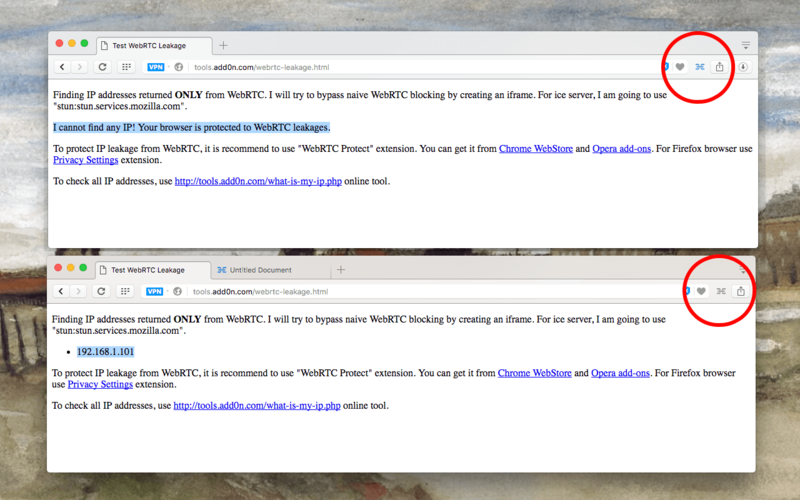 This extension brings control over how WebRTC is used by your browser. You can either use "Disable non-proxied UDP" mode which completely disables WebRTC access or limit WebRTC to "default public interface only". Note that by default browsers use "default public interface and private interface" mode which reveals both private and public IP addresses. What is "WebRTC Protect" extension and how does it work? After installation, a toolbar button is appended to your browser. By default after installation the extension is on, which entirely prevents WebRTC access (the most secure and private mode). However, you might need to allow WebRTC for some websites to work. For instance a peer to peer chat client might have used this technology for its communication. In this case, click the toolbar button once to disable the extension. Note that even when the extension is disabled from the toolbar button or options page (not being disabled completely from extension manager), still your private IP is protected and you can use the peer to peer website. If for any reason a website still has an issue, open the options page and change the disable mode to "Use the default public interface and private interface". This will reveal both private and public IP addresses until the extension is enabled again. When using this extension, am I protected in the incognito mode? It depends on your settings. Make sure to turn "Allow in incognito" checkbox right below the extension in the extensions manager. To double-check incognito support, open options page and you should see a green "Yes" message. Should I activate this extension by default? It is recommended to keep the extension enabled by default and if a website had an issue (which means for some reasons it needs WebRTC access), then disable the extension from the toolbar button. Once you are done with that particular website, make sure to turn the extension on again. How can I check WebRTC leakage? Right click over the toolbar button and select "Check WebRTC Leakage" item or open http://tools.add0n.com/webrtc-leakage.html in a new browser tab. A new webpage opens up and tries to guess your private and public IP addresses by ONLY establishing a WebRTC connection. If this extension is enabled, you should get no IP address. If the extension is disabled, you will get public IP address or both public and private addresses based on your settings. Note that this webpage only guesses IP address leakage caused by WebRTC only. So even if you have no WebRTC leakage, still your public IP address might be traceable. To see complete list of IP addresses use http://tools.add0n.com/what-is-my-ip.php online service. Note that if you want to protect your real IP address, you will need to use this extension along with a proxy changer extension. My recommendation is Proxy Switcher. Still even you are on SOCK5 proxy, if WebRTC leakage is not being blocked by an extension, your real IP address it traceable. So make sure to use these online tools before and after changing proxy settings to make sure you are protected. What is the newly introduced "Disable WebRTC Media Device Enumeration API"? Modern browsers include a new object to the navigator which is called mediaDevices. This object has a method called enumerateDevices that returns a list of all the devices that can be used as audio or video input. The problem with this method is that it provides a unique ID for each device (so that JS code can call the device). This unique ID can be used to track users. To prevent this, "WebRTC Protect" extension returns an empty array when the WebRTC is disabled. When you want to allow a WebRTC connection, simply disable the extension from the toolbar button. This will enable this API as well. To completely disable this new feature, you can use the options page.